I LOVE me some trees! If you happen by my house, don’t see my van and wonder where I am? Check the park first because I am most likely hanging out with the trees. They are the perfect company for me as we don’t have to be concerned about how we are dressed, how much $$ we have in the bank or our social media stats (hey now). By merely sharing some space, we give each other what we need, I offer carbon dioxide and the trees return plenty of oxygen. When I need to talk, they are great listeners and when I am in need of sage, wisdom, trees are happy to share. Of course, I found, looking through the calendars of special days on the internet that May 16th is LOVE a TREE DAY! When I found out that this day existed, I almost jumped for joy because it creates a reason for people all around the world to connect with trees wherever they are. Naturally I found nothing about how this special day started, or no particular group who takes responsibility for it’s creation however there was a suggestion that we use the hashtag #LoveATreeDay all over social media to promote the love! I did find a couple thoughts about what we can do in celebration. The most classic activity would be to plant a tree! Now, I must say, there are plenty of trees, saplings, seedlings, etc. to chose from but what you may want to do it check with a local nursery about what would work best in your area. Certain trees need specific soil conditions, so these requirements will need to be considered. Also, you want to look at the location. Roots from trees can grow d-e-e-p. Make sure you inquire about the space the tree needs before choosing a tree. If planting is not something you can do, then just go hang with some trees. I mentioned the park but if you have trees in your yard, grab a chair and get comfy. Maybe you have a botanical gardens near by and you can take a field trip. Grab a friend or two and make a day of it. This entry was posted in Just Stuff and tagged #1 Best Selling Author Annette Rochelle Aben, Arbor Day, go to the park, Haiku, hug a tree, Just Stuff, Love a Tree DAy, May 16th, oxygen, plant trees. Bookmark the permalink. I love trees too and they show us their beauty all the year. I love trees too. I am going to tell everyone its love a tree day. 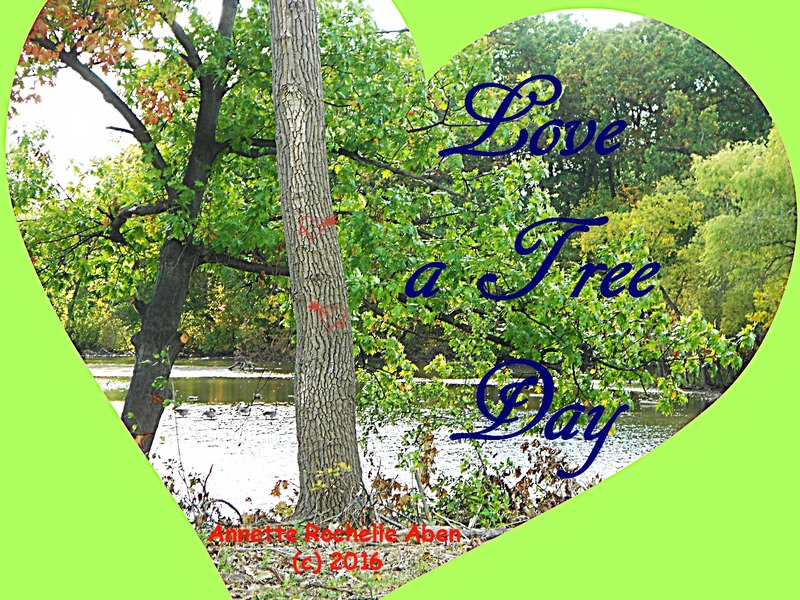 from annetterochelleaben.wordpress.com It`s love a tree day pass it on. Happy love a tree day to you too!! Thank you! Getting ready to head to the park! Happy Tuesday already. I hear they are calling again. Go! This is perfect…I was unaware!